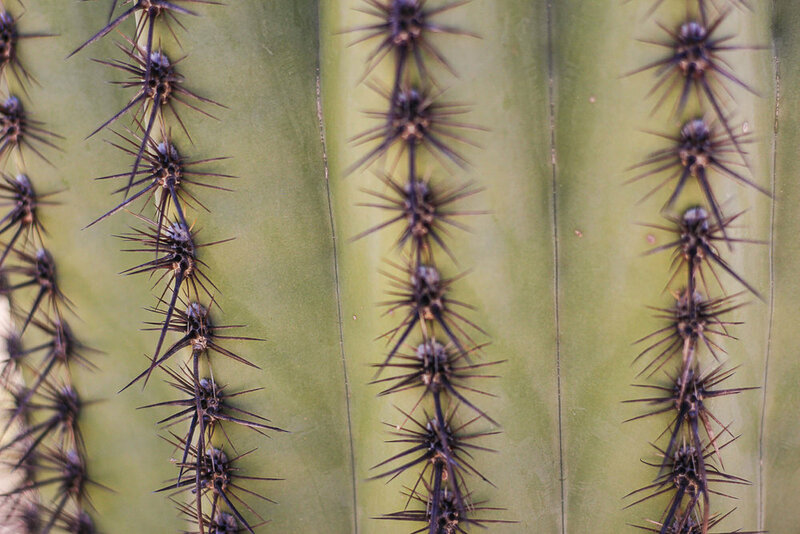 5 Shocking Facts about Arizona’s Saguaro Cactus. Did You Know These? For me, Arizona is in my top five. I love Arizona's dry desert! It's probably because the landscape is so different from what I grew up with on the east coast. So when we got the chance to fly cross-country to Tucson, Arizona two weeks ago for an RVer’s Escapade, I couldn't wait! I was pinning desert photos weeks in advance. I was so excited to be beneath AZ's glorious pastel desert sunsets. And, be in the midst of cactus forests! But, when we raced into the desert in Tucson's Sabino Canyon, I was shocked. Look how big these cacti are! We're so tiny in comparison! We hadn't seen these big guys in other parts of Arizona before. So, I did some research. 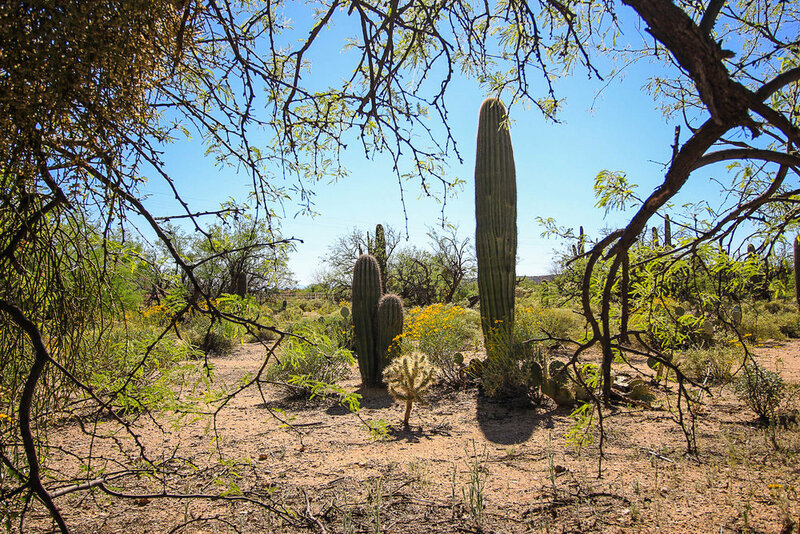 Here are five shocking facts I learned about Arizona’s Saguaro Cactus. 1. It’s the largest cactus in the US and it can grow to 70 feet tall! That’s taller than a 5 story building! 2. They can weigh up to 6 tons! Okay, let me do some quick calculations. 1 Saguaro cactus = 6 Bernadette's! That means one of these cactus’ can weigh up to six Bernadette’s! Now, that's a heavy load! 3. They only start growing arms or branches when they’re 50 to 70 years old. In even drier areas, they may not grow arms until they’re 100 years old! Here are some young bucks in the front right without arms and there's some old geezers in the back left with- let's count them- at least five arms! I wonder how old those old ones are? 4. They normally live to be 150-175 years old! That means, the oldest of these cacti have been standing in the same spot for 73,000 days! Can you imagine? I wonder how old these two are? The left one seems to have extra growths. 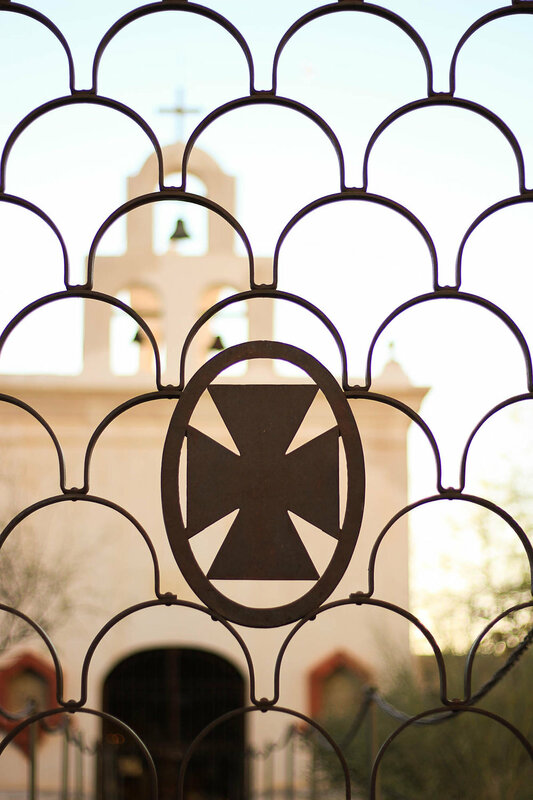 When we were in Tucson, we also visited San Xavior Mission del Bac. It's the oldest intact building in Arizona. 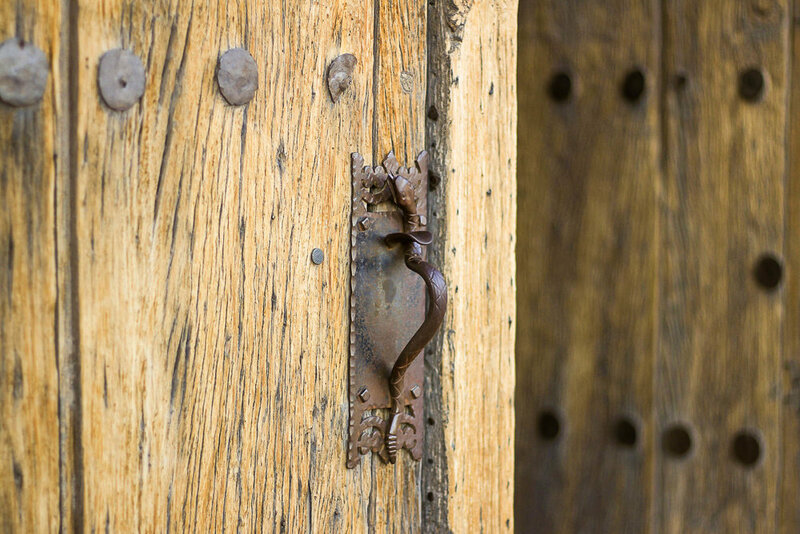 The mission has been standing in the same spot since 1797 and has been a part of three different countries since then! Now, that's some history. Okay, back to the final cool cactus fact. 5. You can only find Saguaro Cacti in the Sonoran Desert. So, get plans going to adventure Tucson. Make sure to visit these three awesome Tucson spots while you're there. 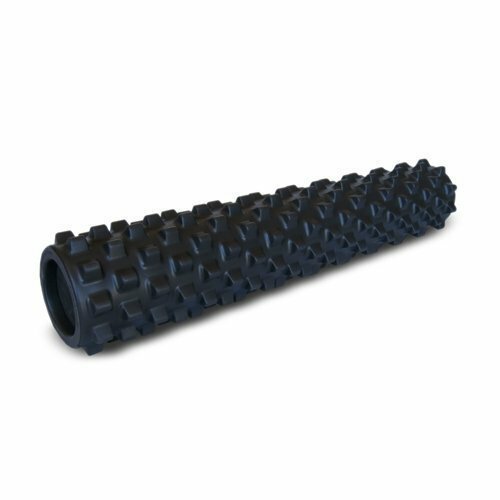 You can also see the Saguaro Cactus in Southern California or Northern Mexico. These facts are crazy right? I had no idea! I kept telling whoever I could find around me- "Did you know...?" and "Did you know...?" Share these facts with your friends and see if they're surprised, too! Stay updated on other fun findings from our #nuventures. Subscribe and we'll discover together! 10 Must Pack Items for the Desert in Tucson, Arizona: Don't Forget these Essentials Like I Did! It's 4:46 AM on a Tuesday morning and here I am standing in Hartsfield- Jackson Atlanta International Airport snaking my way through the security line. We were preparing to get on a cross-country flight to Tucson, Arizona for a 48 hour trip. It was a mad dash for us. We had so much fun! Here’s 3 places in Tucson, AZ you have to visit! Sabino Canyon is a 30 minute drive from Tucson’s airport at the base of the Santa Catalina Mountains. There’s no shade in this desert. Our suggestion: only visit in the early morning or go at sunset. We went midday and it was so hot we only lasted 30 minutes. Those thirty minutes were awesome, though! We took the 0.5 mile nature trail and saw awesome cacti and wildlife. Here's a packing list of 10 essential pieces of gear to have with you. El Charro Cafe was a yelp treasure we found and glad we did! We got in on a 95-year-old tradition by ordering the Carne Seca Recipe platter. For ninety five years, the restaurant has been solar cooking the carne on top of buildings in downtown Tucson in cages over several days to be served in your burrito. Tucson has the perfect arid environment for the meat to be cooked by the sun. The owners won’t even do it at their Phoenix location. Pretty unique! Ask for a sample before you order, though. Our waitress Bridgett said you either love it or you hate it. We loved it! We were so stuffed, we didn’t have room for their flan. Bridgett said they have the best flan. Our suggestion: save room for dessert and order the flan. We missed out. 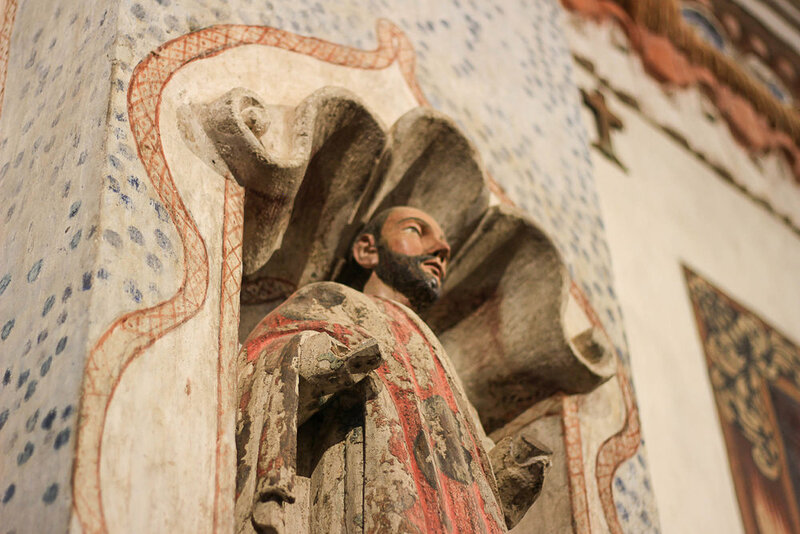 San Xavior is a thirty minute drive from Tucson's airport. The architecture, the surrounding views, and the history make it an awesome spot to stop! 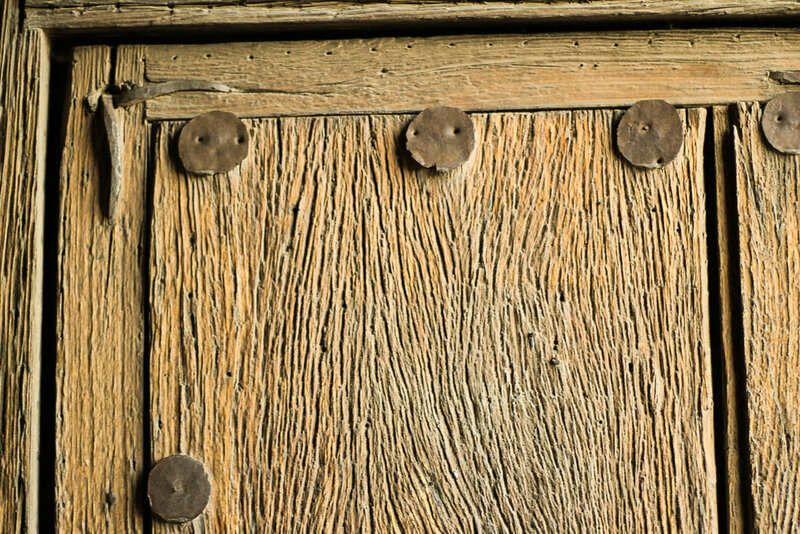 San Xavior is the oldest intact European structure in Arizona. The building has belonged to three different countries since it was completed in 1797. This was when Southern Arizona was a part of New Spain! Then in 1821 when Mexico gained it's independence, the mission became a part of Mexico. Then, with the Gadsden Purchase, the mission became a part of the United States. Crazy history! on other fun destinations we find on our #nuventures. Sign up and we'll discover together. How do you meet cool new people when you're traveling full time? Well, we've tried a lot of things. We go to cool events in town. We talk to strangers all the time: at the beach, at the laundramat, at camp, and about our Roost stands at coffee shops. Small talk is great, but what we're really looking for are new friends in town to do cool stuff together. The challenge is building a quick relationship. How do you meet someone new + get comfortable enough to want to share time together in the future + in a short amount of time? 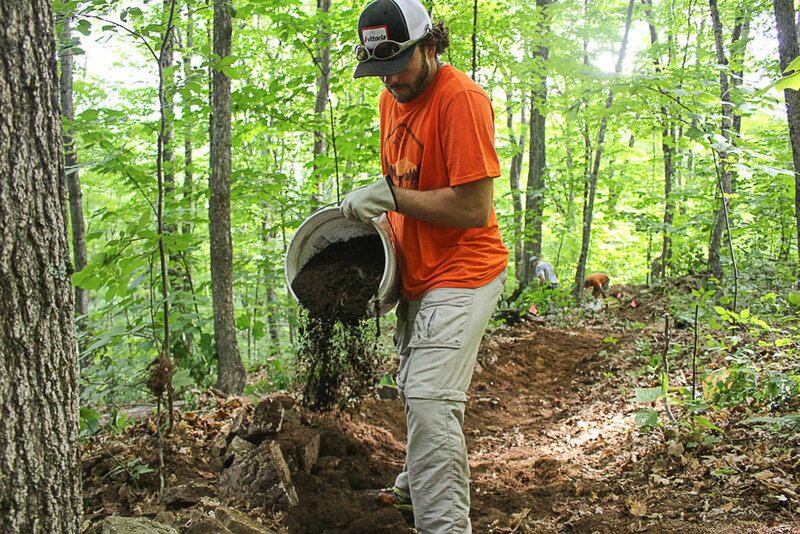 After traveling full time for 2.5 years, we've found a favorite solution to meeting cool, like-minded, people: Trail work days. 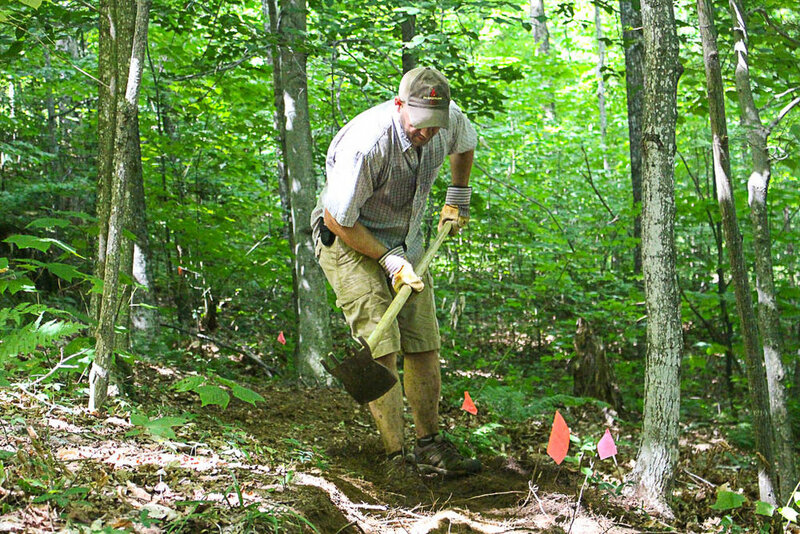 Trail work is helping build and maintain local trails. 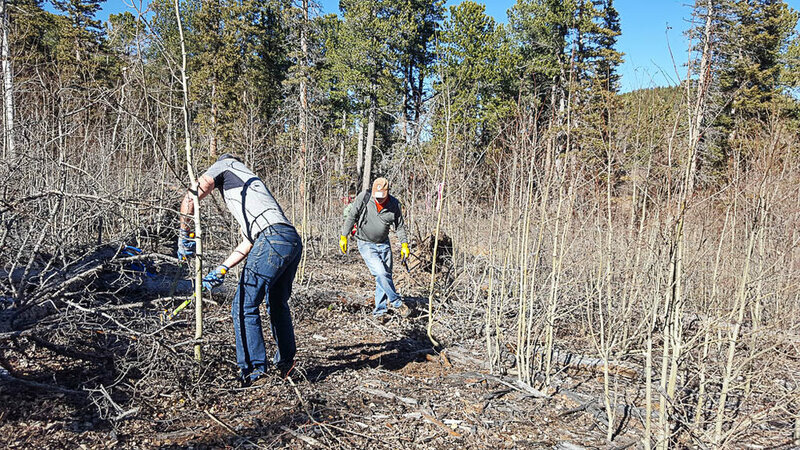 We've volunteered building trails in Vermont at Ascutney Trails and in Colorado on Pikes Peak. These days have been awesome! We've learned working on a project together with new people (who we know already like to be on trails) gives us time to chat, bond, and move forward in a friendship if we're keen. And- you go to new places and see new views you'd never trek to without having the mission of trail work. Look at this view! I wanna go back! View from Mount Ascutney, Vermont with Jim and Steve on Ascutney Trails. 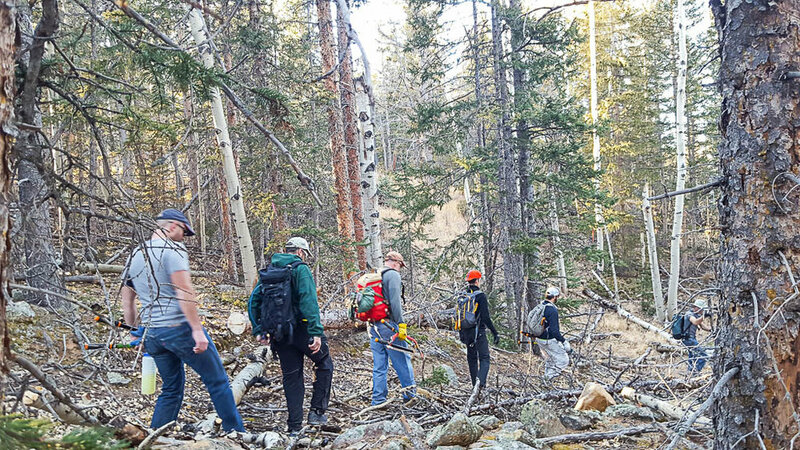 In Colorado Springs, we worked on the Missing Link Trail with Medicine Wheel Trail Advocates. 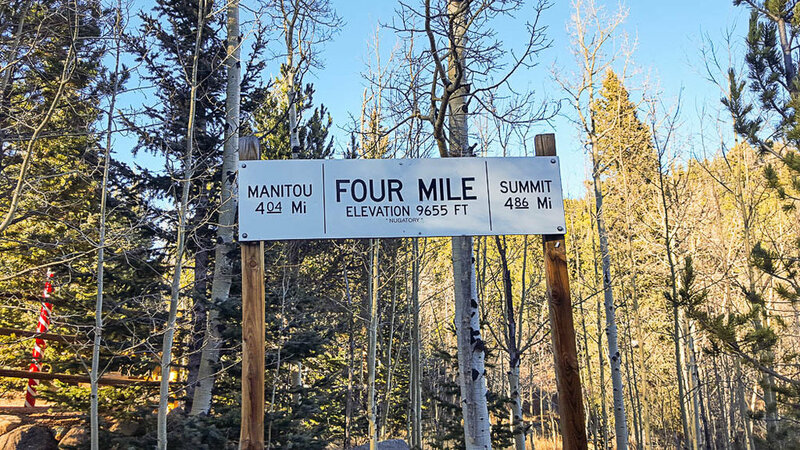 To do this, we got free tickets to take the Pikes Peak Cog Railway up the mountain to the Four Mile stop and start working. 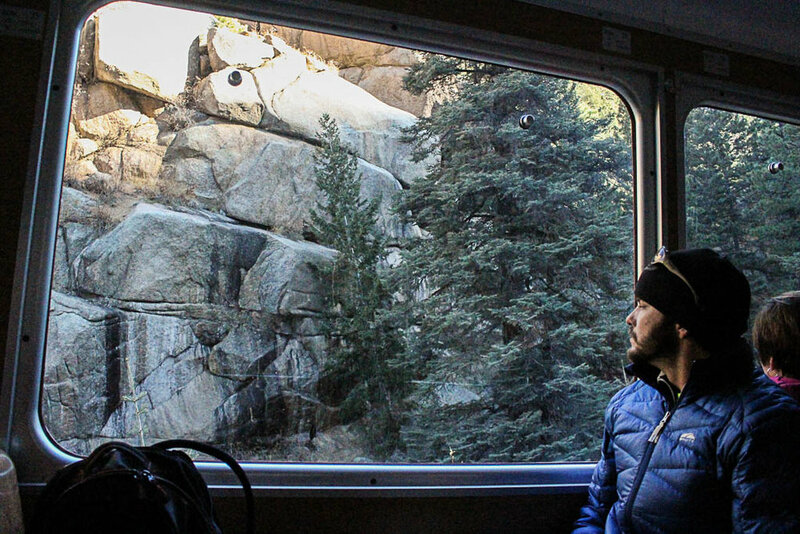 A free train ride on Pikes Peak? Now, that's cool! 2. You get a different kinda workout. Moving rocks? Digging? Raking? Heck yeah! We don't do this every day. 3. You meet awesome people! When you're in the woods walking together, working hard together, and sweating together, you're bound to form new friendships. Who knows, you could even meet your next trail buddy! 4. You learn new stuff! We've learned how to use new tools. And, we've learned the strategy behind building trails. Did you know, when building a trail you should use the natural contours of the earth to plan the trail? And, trail builders form the trail so water runs off in sheets, instead of forming a river and creating ruts down the trail. I know! News to me, too! 4. You gain appreciation for the trails we use. When you're out there working hard, getting blisters, and working up a sweat, you look around and gain major appreciation for all of the hard work from those that came before you. You realize someone had to build these trails and someone has to maintain them. You also learn the history of the trails you're on and the tenacity of the people who dream them up and build them. Our friend, Jim Lyall (in the front above) has been working for 9 years to get permission to link the Ascutney Trails system to the local state park with a five mile trail. Talk about perseverance! We got to work on the linking trail on our trail day. So cool! 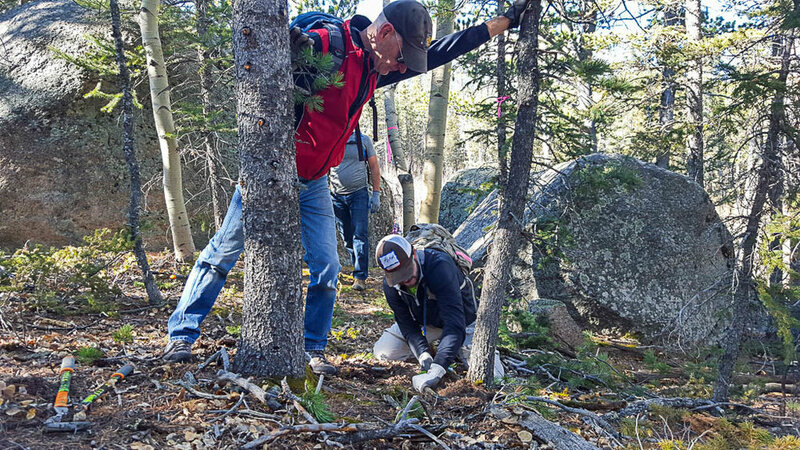 In Colorado Springs, Medicine Wheel's been working for 20 years to gain permission to build the Missing Link Trail to add to Pikes Peak's Ring the Peak trail. Talk about being perseverance and persistence. Amazed by these trail builders! We are always out on trails. When we're out there, we're making memories. Whether it's seeing a new place, escaping to the quiet, spending time with someone special, celebrating a birthday, or even being proposed to- trails are a big part of our life. We have a responsibility to help maintain them for ourselves, our kids, our grandkids and anyone who comes after us. 6. Bonus- You get free food! Okay, let's be real. We really go for the free food. I'm kidding... no seriously... I'm kidding! Thanks Whole Foods and UpSlope! How do you find trail work days? 1. Local mountain bike groups. 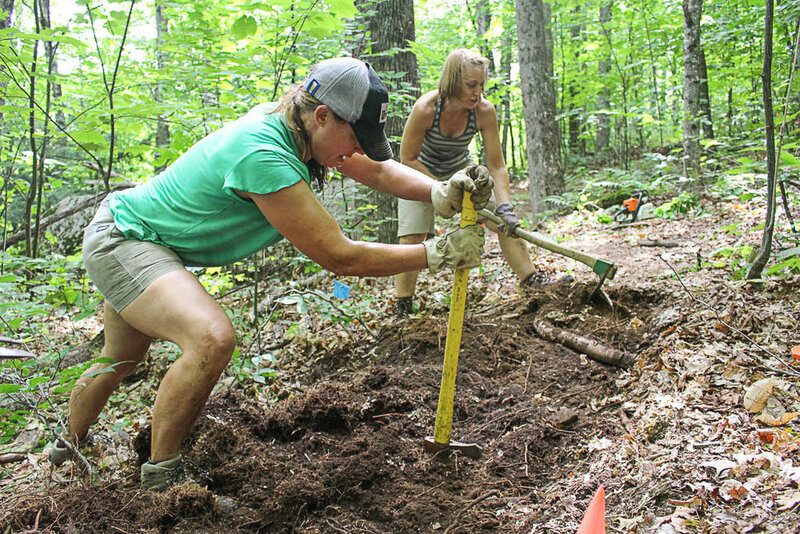 We've found out about trail work days from local mountain biking groups. 2. Find your local parks and trails websites. Then, check out their upcoming events. Don't forget state parks and national parks. 3. Can't find a local trail days but want to get outside with other folks? Become a member of Gociety! Gociety connects people who want to get outside and do awesome stuff together. We've gone out on running and climbing events with folks! It's awesome! on other aspects of this lifestyle we've figured out. Sign up and we'll learn together! I've been busting to share this, because we found a game changer for how we work in our camper! Well, Adam's had this figured out for awhile. I'm late to the party and it's a good one! When we transitioned to living and working in the camper, Adam set himself up with a stand up desk and a Roost Stand to protect his posture by bringing the computer to eye level. I didn't think this was important until I saw a video of me working. I'm a hunchback on my computer! You can look- the moment's only 11 seconds in. I couldn't believe what I looked like in the video! I freaked! I don't want to be a hunchback at 30! Adam's always told me my posture is terrible. However, he'd tell me when I was super focused on a project. I'd sit up straight for a minute then get engrossed in the project again resuming hunchback position. After seeing the video- I was converted! 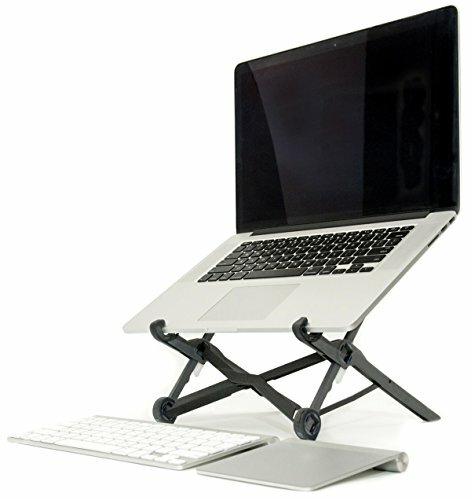 I bought myself a Roost Stand on the spot. That's the fastest $70 I've ever spent! 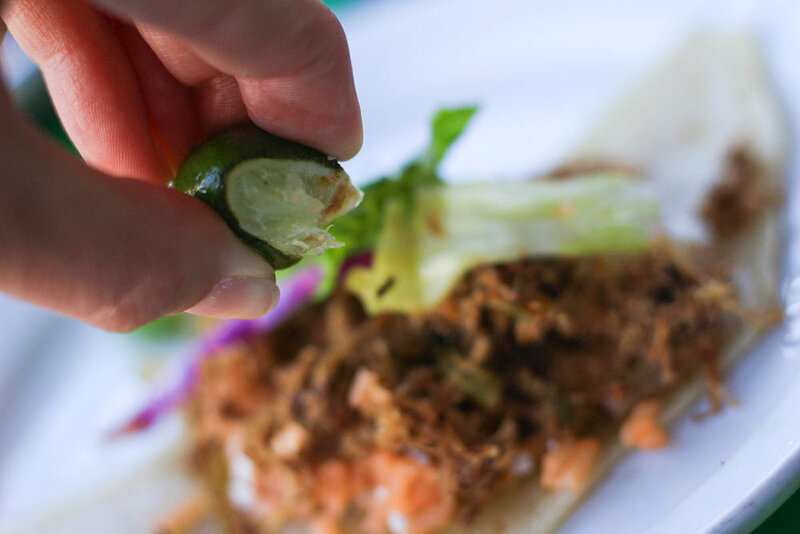 Knowing us, you know we'll debate and research days over spending $3 on a taco. Now, we both use Roost stands, but have had to make adjustments. Be warned! We're a sight when we both post up with our Roost stands at coffee shops. We get a lot of curious looks. The stand's have proved to be the best conversation starter to meet locals in a new spot! 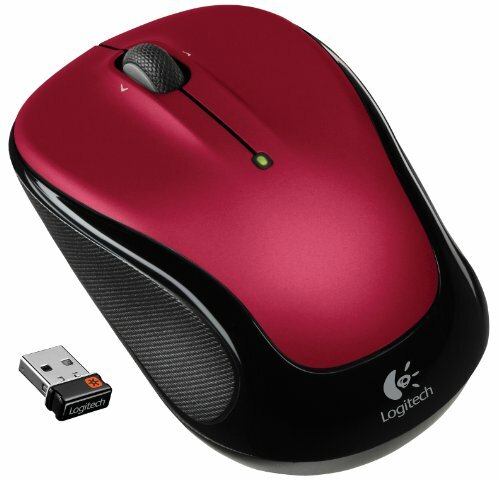 Wireless mouse. Found this at Walmart for $10. 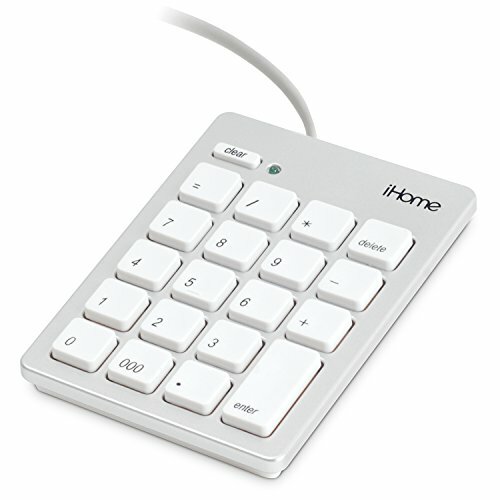 Wireless keyboard. I snagged one for $15 at Staples. For less than $100 I got myself un-hunched! I gotta prioritize my back and neck! 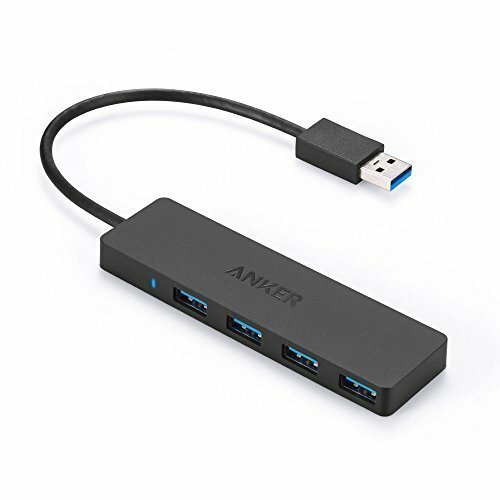 USB hub to connect the iPad as a dual screen using the app Duet. We have to duplicate coverage by having both AT&T and Verizon service on the road. 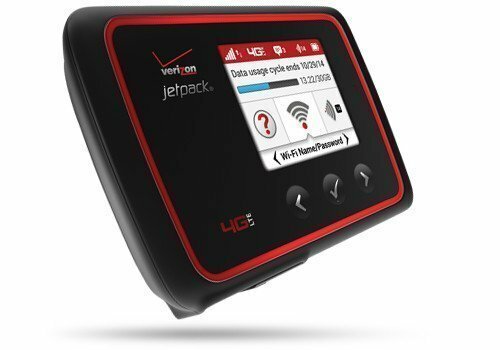 Our main source: Verizon's MiFi Hotspot. We get 12GB for $90 per month. For backup when there's no Verizon signal, we use our AT&T phones as hot spots. 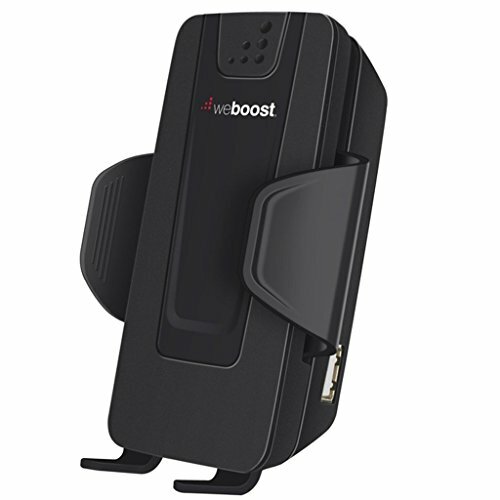 To boost our service, we just got a wifi booster. We had trouble finding any signal in Florida and had to re-route ourselves. Hopefully this will help. Check out more gear we use on the road here. Your turn! What's on your desk that you can't live without?